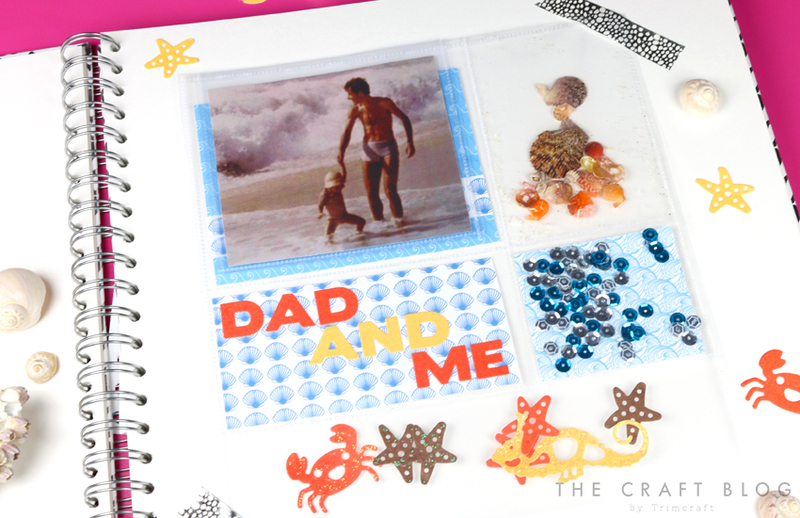 This sunny Father's day layout designed by Maxine is so interactive and so crafty! She has really brought a special day from the past, back to life! Read on to find out how to make your own with a few We R Memory Keepers goodies. 1. Begin by placing your chosen photo into the We R Memory Keepers photo pocket, use the We R Memory Keepers Fuse to seal three sides, leaving the top open. Place this to the side. 2. Die cut the sea creatures from the First Edition Under the Sea dies onto the coloured Dovecraft card blanks. Add Dovecraft glitter glue to some of the die cuts. Allow to dry. 3. Cut a 6cm x 12.5cm piece of Simply Creative Life’s a Beach paper. Use a First Edition Alphabet die set to die cut the words DAD AND ME. Adhere the letters with glue to the backing paper. 4. Next, cut a complementing Life’s a Beach paper design down to 6cm x7cm. Place to the side. 5. Cut a coordinating piece of Life’s a Beach paper down to 12.5 x 9cm. Add a decorative strip of paper from the same pad to the bottom. Die cut the word lovely and Day with the First Edition Alphabet and Sentiment Dies sets. Adhere to the backing paper. 6. Take another We R Memory Keepers photo pocket 12 x 12 size. Place the sea creature die cuts in the bottom and use the fuse to seal the bottom section. Put the DAD AND ME paper in to the next space and the lovely day paper above it, seal these sections. 7. Add the sequins and the 6cm x 7cm piece of backing paper into the next section, next to the DAD AND ME pocket. Seal the section as you have done before. TIP – Make a scoop from a piece of scrap paper to help you to get the sequins into the pocket. Add shells and sand in the section above and seal the side with the We R Memory Keepers fuse. Place the photograph in the pocket on top of the ‘lovely day’ section. Seal across the top with the fuse. Cut off any excess of the photo pocket to finish. TIP Use the lines of a glass mat as a guide to get your sections straight. What a wonderful scrapbook layout! The sections filled with seashells and sequins really makes this a pretty and personal scrapbook, a gift your dad will be sure to treasure for years to come! What scrapbook layout will you create this Father's day? We would love to see, so don't forget to upload your makes to the inspiration area and to #trimcraft when uploading to social media!